Three great movie clips on this week's Cinema Playground: Screen Test 89! Can guess the movie, actors, and the year of the film? Fuhgeddaboudit! We're back with a grab bag of movie clips on this week's Cinema Playground: Screen Test #87. We trade in our popcorn and Milk Duds for peanuts and Cracker Jacks for Cinema Playground: Screen Test #86. On this week's Cinema Playground: Screen Test we rewind back to episode 38 with three quotes from classic movies from the 1930s and 40s. On this week's Cinema Playground: Screen Test #84, three movies featuring the main characters talking to themselves in the mirror. We refill your cup with 3 more coffee related movie quotes on this week's Cinema Playground: Screen Test #83. You know how to whistle, don't you Steve? Just put your lips together and blow. This week's Cinema Playground: Screen Test features three movie scenes featuring whistling. Can you name the movie, year, and tune? The highly caffeinated Cinema Playground: Screen Test #81. Three coffee-related movie quotes. We're serving up three food-related movie quotes on the Cinema Playground: Screen Test #79! On Cinema Playground: Screen Test #78, we bring you three character sounds... Can you name the character and the movie? If you like this one be sure to check out episodes #37 and #69. Ho! Ho! Ho! It's another Christmas-themed Cinema Playground Screen Test! It's a Christmas Miracle! 3 Christmas related movie quotes on the Cinema Playground Screen Test #76! From the theater archives... three more movie quotes plus trivia on the Cinema Playground: Screen Test #75! ...but wait there's more! 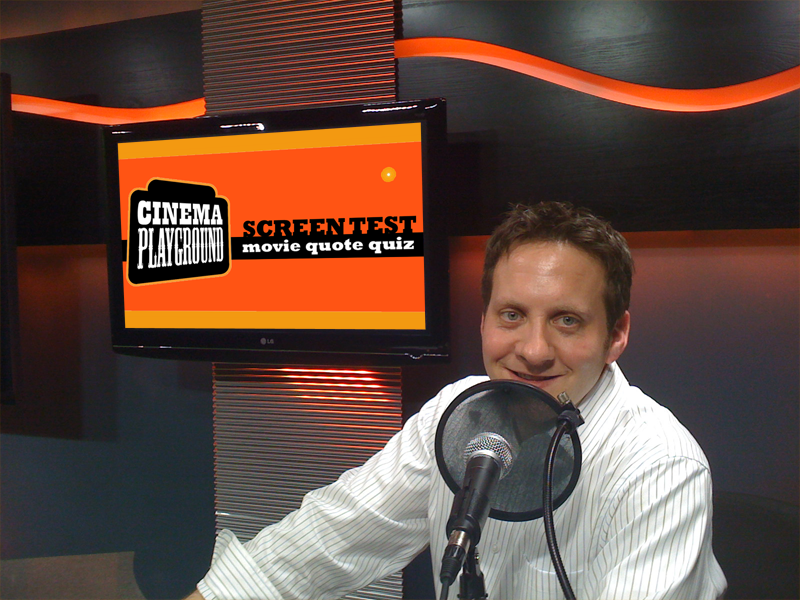 3 Quotes AND 3 trivia questions on this week's Cinema Playground Screen Test #74! In honor of this weekend's Academy Awards, listen to one of my favorite Cinema Playground Screen Test podcasts, the Oscar Trivia Edition (#15) from March 2006, recorded with Stunt Double Andy. One of the trivia questions is no longer accurate. Can you name which one and why? Also, in another bit of trivia, this was only one of two podcasts that had a co-host, and only one of two that used trivia instead of movie clips. 3 fan favorite movie quotes on this week's Cinema Playground: Screen Test 72! You'll get these! 3 more movie quotes on the Cinema Playground Screen Test #71! Do you understand the words that are coming out of my mouth?! 3 indistinguishable quotes on this week's Cinema Playground Screen Test #69. Three more computer related movie quotes on this week's Cinema Playground Screen Test. Take 68. Three computer related movie quotes on this week's Cinema Playground Screen Test #67. Cinema Playground returns with more movie quotes on the Screen Test #65, or is it #66? Changing gears with with 3 car related trivia questions on Cinema Playground Screen Test #66! It's your Cinema Playground #64... how do you like them apples!? Back in the saddle with Cinema Playground Screen Test #63! Test your movie quote knowledge with Cinema Playground Screen Test #57! The long overdue Cinema Playground Screen Test #56. Extremely memorable quotes but can you name the movies? Your dose of movie quote trivia on the Cinema Playground Screen Test #53..
Where in the world is Jim this week? From Ottawa, it's Screen Test #51! Finally back in the studio for Screen Test #49... I've missed you. From Miami Florida, it's your Cinema Playground Screen Test #48! From Cologne Germany, it's your Jetlagged Cinema Playground Screen Test #47. From Sunnyvale California, it's your 80s edition of the Cinema Playground Screen Test! Yo-Ho-Ho! We've found Movie Quote Booty on the Cinema Playground Screen Test #45. 3 easy quotes on the Cinema Playground Screen Test Ocho -- #44. It's no secret this is the fastest 2 minutes on your IPod. Your weekly Cinema Playground Screen Test #42. From the crypt, it's the Screen Test Halloween edition. Three horror-filled sound clips. Can you name the movies? From Boston, it's Screen Test #40! 3 easy quotes this week (perhaps even too easy.) Enjoy! Reaching deep into the DVD collection for 3 classic quotes... it's Screen Test #38! Three quotes that may sound like gibberish but can you name the movies? It's Screen Test #37! Time to quiz your 90s movie knowledge with 3 quotes from the 1990s. You know the drill.. Screen Test #35! It's time again to test your movie quote knowledge. It's your weekend edition to your Cinema Playground, known to the world as Screen Test #34. Screen Test #33. 3 Memorable Quotes. 3 Memorable Movies. Serving up another helping of the Cinema Playground Screen Test. It's Bruce Willis weekend on the Cinema Playground. Back with a little slice of movie quote heaven... Cinema Playground Screen Test #30. Finally returning to the CP Studios after another cold... it's Screen Test #29. We're calling #28 Mike's Free Pass Screen Test. 3 Quotes. 3 Movies. Who's Looking Good? Play the Cinema Playground Screen Test to find out! Test your movie quote knowledge with the Cinema Playground Screen Test. 3 Quotes. 3 Movies. It's the Cinema Playground Screen Test. Back Again with another Cinema Playground Screen Test. 3 Quotes. 3 Movies. From the Acadia Cafe in Minneapolis, in association with PodcastMN this is the Cinema Playground Screen Test with Jim, Mike, and Stunt Double Andy. And for nearly a decade, it was a popluar daily email newsletter featuring movie news, quotes, trivia, movie releases, and more. In 2005, Cinema Playground became a podcast that has been downloaded over 2 million time and that has been featured in Entertainment Weekly, Apple iTunes, and Microsoft Zune Marketplace. It has had several spin-offs including the Cinema Playground: Trailer Park, Cinema Playground: A-to-Z, Cinema Playground: Screen Test, and Cinema Rant.